Cambodia intends to lodge a complaint to UNESCO for the damage caused to the Preah Vihear temple caused by Thai machine gun fire. The gunshots, affecting about 66 stones, were made last week during the lastest gunfight between the Thai and Cambodian armies facing off at the temple grounds. 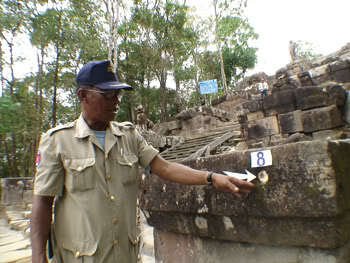 Gunshot damage on the walls are quite a common sight in Angkor, but they were a product of the earlier civil war. It’s sad to see that we have not learnt any better. The most recent fighting between Thai and Cambodian troops at Preah Vihear have resulted in fatalities and casualties, although different reports provide conflicting news about how many people died and were injured on both sides. Both sides seem to ancknowledge that the fights were results of misunderstandings rather than intentional hostilities. Tensions between the two countries came to a head again after a small exchange of gunfire this afternoon escalated into heavy fighting between the Thai and Cambodian troops, in at least three spots in the vicinity of the Preah Vihear temple. No reports of casualties or deaths, but it’s been reported that the firefights have taken place within the disputed area and that Cambodian troops have used rockets.